USS Cyclops photographed by the New York Navy Yard, probably while anchored in the Hudson River, NY, on 3 October 1911. National Archives photo 19-N-13451. Ninety-five years after the loss of USS Cyclops and 309 souls [1. www.history.navy.mil/danfs/c/cyclops-1.htm ] in the North Atlantic in March 1918, the precise mechanism of the sinking and the location of the wreck remain unknown. This incident, during World War I, is the largest loss of life in the history of the United States Navy of a U.S. built steel hulled warship where there simply is no direct evidence of why it happened, when it happened, or exactly how it happened. As we near the centennial of the loss of Cyclops, it is appropriate to remember the ship, her officers, and crew and to review their valuable contributions. Moreover, the long-accepted opinions as to the contributing causes of the loss of Cyclops may be helpful to the understanding of risks faced by commercial bulk carriers which have been lost at “an alarming rate” for many years. In April 1917, when the United States declared war on Germany and other Central Powers, the U.S. Navy was in transition from coal burning warships to ships powered by oil. This would have a direct impact on the capital ships sent to the United Kingdom to reinforce the Royal Navy’s battleships. Ultimately, naval oil reserves would present major issues throughout the 1920s – the Teapot Dome Scandal concerned illegal leases of naval oil reserves, and the dissolution of the Ottoman Empire and the colonial establishments in the Middle East were greatly influenced by the European navies’ demand for oil for their merchant ships and warships. Following the Spanish-American War (1898) and the circumnavigation of the Great White Fleet (1907-09), the fleet’s worldwide demand for coal was viewed as a major weakness in its combat capacity. Dependence on foreign coal and foreign ships to transport that coal were major concerns. 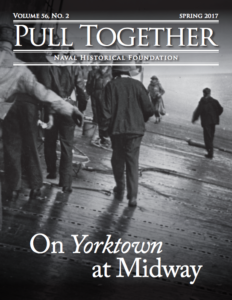 During the first fifteen years of the twentieth century, the U.S. Navy commissioned a dozen colliers. Some were converted to other types. [2. www.ibiblio.org/hyperwar/OnlineLibrary/photos/usnshtp/ac/w1ac-2.htm%5D Two of these colliers would earn eternal mention – USS Jupiter would be converted to USS Langley (CV 1), the first U.S. aircraft carrier, and USS Cyclops would be lost in a mysterious manner that raised the concern and interest of the Navy, the nation, mariners, and historians worldwide. Cyclops, the only ship of her class, was engaged in the transportation of bulk cargo to and from the United States to Brazil in early 1918. On 9 January 1918, she was assigned to Naval Overseas Transportation Service, departing Norfolk the day before with 9,960 tons of coal for English ships in the South Atlantic. [3. www.history.navy.mil/danfs/c/cyclops.htm 1.htm and Momsen, Richard O., American Vice-Consul in Charge, letter dated Rio de Janeiro, Brazil, April 27, 1918 concerning the U.S.S. “CYCLOPS” on which Consul-General Gottschalk was a Passenger.] She arrived at Rio de Janeiro on 28 January 1918; she departed Rio de Janeiro on 15 February, carrying a load of 10,800 long tons (11,000 t) of manganese ore, and on 20 February, Cyclops entered Bahia. [4. Momsen, Richard O., American Vice-Consul in Charge, letter dated Rio de Janeiro, Brazil, April 27, 1918 concerning the U.S.S. “CYCLOPS” on which Consul-General Gottschalk was a Passenger.] Two days later, on 22 February 1918, she departed for Baltimore, Maryland, with no stops scheduled. Rather than proceeding directly to Baltimore, as scheduled, Cyclops deviated to Barbados, arriving on 3 March 1918. At this port she was about 1,800 nautical miles from destination. Before leaving Rio, Commander Worley, the commanding officer, reported that Cyclops’s starboard engine was inoperative because it had a cracked cylinder reducing her speed to 10 knots. This was confirmed by a survey board, which recommended that the ship return to the U.S. for repairs. There were suggestions that the ship was overloaded when she departed Brazil. Certainly, the addition of more coal in her bunkers and water at Barbados may have offset any reduction in draft achieved during the voyage north. Post-sinking investigations in Rio concluded that the ship had been heavily loaded. She had no prior experience carrying ore.
Cyclops departed Barbados for Baltimore on 4 March but never was seen again. A rumored sighting on 9 March off Virginia by the molasses tanker Amolco was denied by that ship’s master. It was improbable that Cyclops was off Virginia on that date because she was not due at Baltimore until 13 March, and her speed of advance was reduced to about 240 nautical miles per day because of the unseaworthy engine. The weather off the Virginia Capes on the following day, 10 March 1918, reportedly was violent. In any event, Cyclops failed to arrive at Baltimore and no wreckage has ever been found. The history of USS Cyclops also involved the most interesting and contentious claim about a ship’s post office. Thanks to the untiring effort of Captain Todd Creekman, USN (Ret), Executive Director of the Naval Historical Foundation, and Marvin W. Barrash, the author of the definitive study of the ship titled simply USS Cyclops, [5. Barrash, Marvin W., U.S.S. Cyclops, Heritage Press: 2010.] a single genuine example of an envelope postmarked on board Cyclops has been located at the Franklin D. Roosevelt Presidential Library, where it has been for over 70 years. More than 90 years after the loss of the ship, naval postmark and cover collectors have been introduced to this unique cover. Cyclops had a post office on board for about seven months, from mid-July1917, when she returned from France, until her sinking. During that time she made a brief voyage to Nova Scotia and undertook her fatal cruise to Brazil. It is likely that Cyclops was carrying the fleet mail from Brazil to the United States when she disappeared. 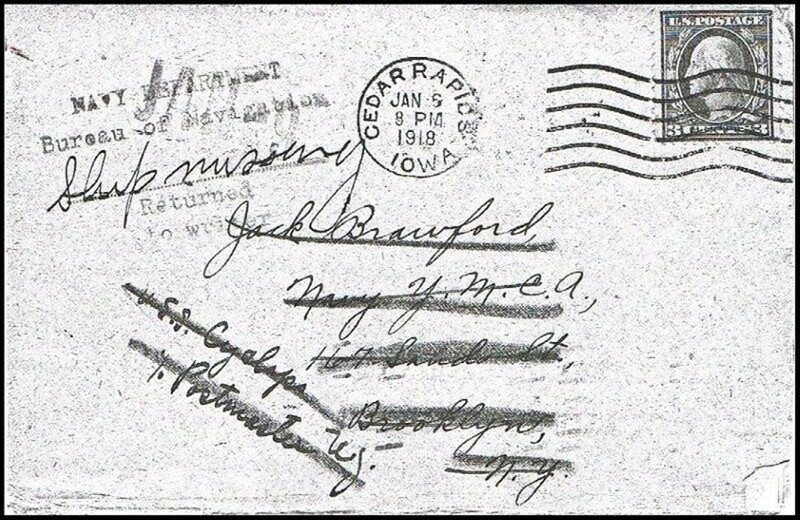 But the single, surviving cover with her postmark was dated 28 January 1918, the day of her arrival at Rio. Even if Cyclops was carrying the fleet’s mail when she departed nearly three weeks later, on 16 February 1918, it is probable that mail was carried by a ship that departed Rio at an earlier date in late January or early February 1918. 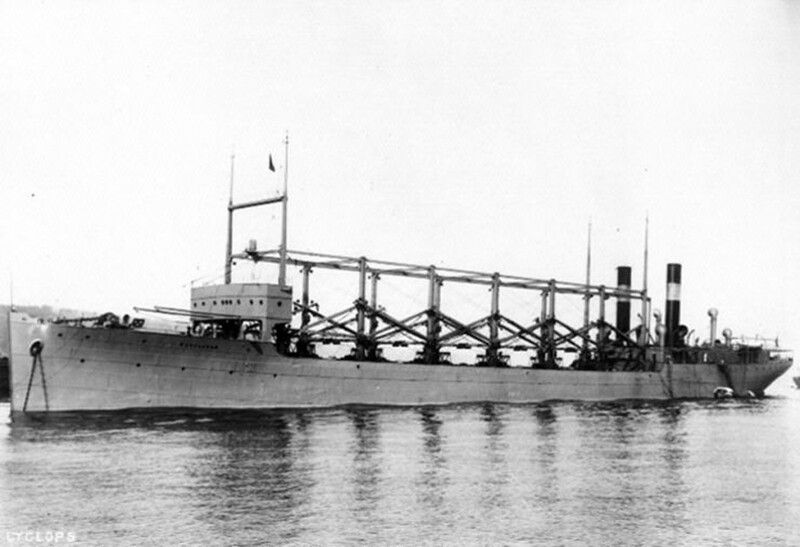 Following the April 1917 declaration of War by the U.S. Congress, Cyclops was commissioned on 1 May 1917, Lieutenant Commander G. W. Worley in command. She joined a convoy for St. Nazaire, France, in June 1917, returning to the east coast in July. Except for a voyage to Halifax, Nova Scotia, she served along the east coast until 8 January 1918 when she departed for Brazil with coal. To a small group of collectors of naval postmarks, there has been a similar, but less morbid, mystery arising out of the loss of Cyclops. The first reported postmark from Cyclops, dated in 1914, was identified to collectors in the mid-1930s by a leading illustrator and student of naval postmarks. A copy of that postmark never has been published. In 1939, however, the same man help publish a Handbook of Naval Postmarks containing his illustration of a 1911 Cyclops postmark. For 60 years that postmark was advertised to be the rarest naval postmark, the only known example of a cancellation from Cyclops. 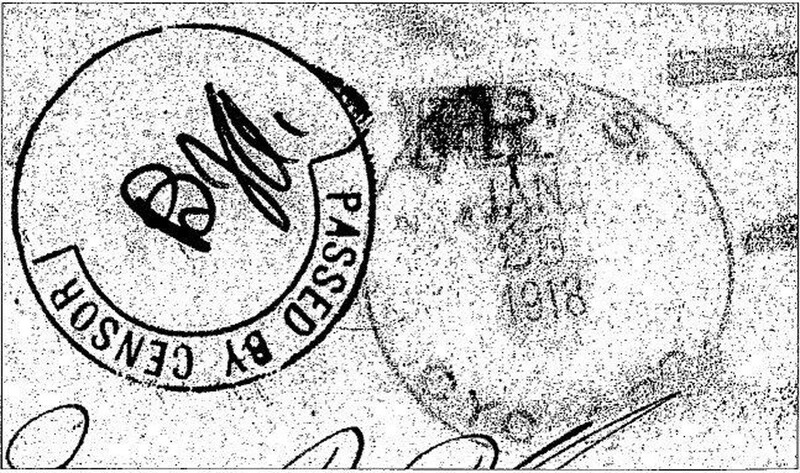 By 1997, however, it was revealed that the 1911 Cyclops postmark was a fake. Unknown to collectors and naval historians, one legitimate example of Cyclops’s actual postmark has been in the Franklin D. Roosevelt Presidential Library since 1942. Thanks to the diligence and scholarship of Captain Creekman and Mr. Barrash, collectors now are able to appreciate that postmark. The third rubber stamp marking on the face of the cover is a single line with the ship’s name placed in the upper left cover, effectively forming part of the return address on this printed envelope provided to Sailors by the YMCA. D. Collectors of ships’ mail. For more than 80 years there have been organized collectors of postmarks and markings from U.S. warships. 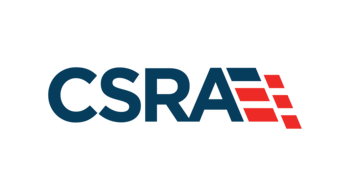 Those who have served as a Public Affairs Officer (or Public Information Officer) or as a Navy Postal Clerk undoubtedly encountered requests from collectors. They are not “spies” or “agents of foreign governments” but students of naval postmarks and covers (envelopes). The membership is worldwide and has included disabled veterans, flag officers, career sailors, new recruits on active duty, retirees, Pearl Harbor survivors, commanding officers, Coast Guardsmen, Marines, Chaplains, postal clerks (Navy Mail Clerks), retirees, civilians, women, children, even incarcerated prisoners, and Air Force veterans. We are a worldwide, eclectic group of collectors who carry on a hobby that began before most of us were born. If you have served in the U.S. Navy or U.S. Marine Corps you have enjoyed the benefits of the Navy’s Fleet Post Offices. In many respects, the Navy’s postal system functions remarkably like it did when it was established more than a century ago. It transports mail efficiently and inexpensively (at least for the senders) to and from ships around the world. The primary purpose of the postal system is to transmit official and personal mail to and from the deployed fleet. A Sailor or Marine can send mail at the prevailing US domestic rate no matter where stationed. And in time of war or other hostilities, “Free Mail” often is authorized for service members in specified areas. In the early twentieth century Sailors were part of a world-wide post card craze. Like email of a later era, postcards were brief and inexpensive ways to communicate. While they were not instantaneous, post cards often carried photographs or illustrations of distant and exotic places; destinations that many could only dream about. Sailors and Marines, of course, had unsurpassed opportunities to visit ports around the world. The recruiting slogan, “Join the Navy and See the World” was truthful advertising. The cruise of the Great White Fleet was a seminal event in the operational reach and scope of the U.S. Navy. Despite service of nearly a decade and crews ranging to 250 officers and men plus the demand of official correspondence, only a single example of Cyclops’s postmark has been reported. This is on an envelope sent by a crewmember when Cyclops was in port in Brazil. Cyclops was not in commission until World War I and her post office was not opened until mid-July 1917. The cover bears a censor’s marking initialed by the Assistant Surgeon Burt J. Asper. 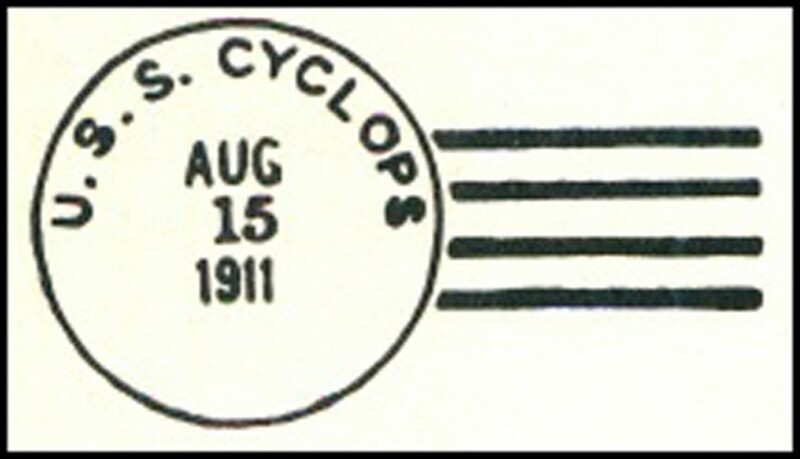 Surprisingly, the postmark contains the ship’s name “USS Cyclops” in the circular device, while most other postmarks issued during World War I (as well as World War II) merely read “U.S. Navy” [14. During World War I and World War II, Navy removed ships’ names from most postmarks and issued cancellation devices which generally read “U.S. Navy” in the circular device. 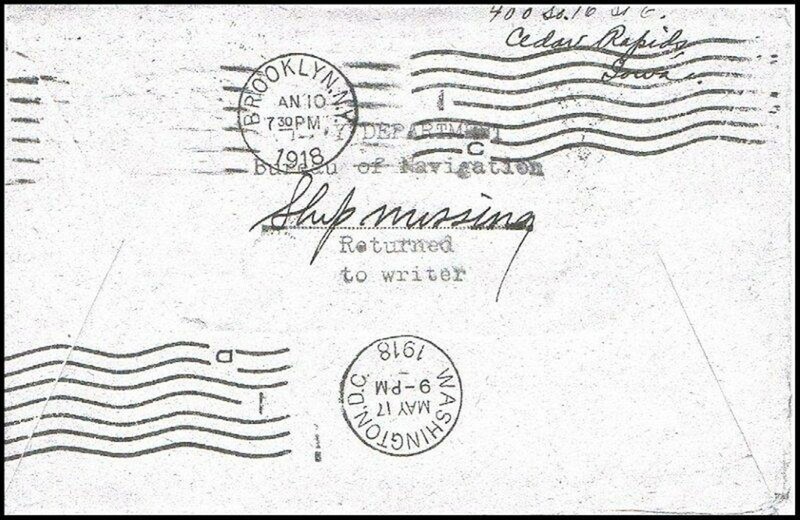 Postmarks which do not contain the ship’s name but have “U.S. Navy” instead have been classified as “Z” postmarks; the most common are types 2z, 3z, both rubber hand stamp cancels, and 7z, a machine postmark.] . It has every indicia of actual use – as Sailor’s mail it would be difficult to question the provenance of this cover and cancellation. But for decades there was another “postmark” purportedly from Cyclops which now is acknowledged to be a fraud. For more than 60 years the only reported postmark from Cyclops was a rubber stamp hand cancel (Locy Type 1, containing a circular dating section with the ship’s name and four killer bars). That postmark has been discovered to be “a fake” – the creation of an early collector and contributor to the original postmark handbooks. [17. USCS Postmark Catalog, 5th Ed. 1997, p. C 32.] A genuine postmark and cover from Cyclops, however, was located nearly 100 years after the ship first was placed in service. In the 1930s an early student of naval postmarks, John Gill of Massachusetts, reported that he had found the first cover from Cyclops. Now it understood that this Cyclops postmark was a forgery or fraud. That full cover was never copied and accounts varied from merely a postmark on a full cover or a post card. The only published copies of the postmark do not appear to have been used on mail as there are neither postage stamps nor the word “Free” commonly written by Sailors in lieu of paying postage during hostilities. The history of Gill’s postmark from Cyclops has been illusive and self-contradictory. Importantly, the postmark initially was reported to be dated 1914 and subsequently the date was changed to 1911. It is indisputable that there was mail sent to and from Cyclops and that a post office was established on board ship. There should have been a significant volume of mail for official business, primarily to the Bureaus at OpNav, and to and from family and friends. There are multiple factors why the envelopes with postmarks from the ship were not preserved. World War I was before collecting covers became a hobby. Family and friends were more interested in the contents of letters than the envelope. When the ship and crew were lost it many distraught survivors destroyed the correspondence as was the custom. Moreover, the ship had been in service for nearly seven years prior to the establishment of her post office. The officers and crew may have been in the habit of sending the mail from port rather than the on-board post office and perhaps they expected that mail posted ashore would be moved faster. The following are Marvin Barrash’s extracts of letters from one member of the crew of Cyclops to his family in 1917 and 1918. The sole genuine example of a postmark from Cyclops was found among this correspondence. All are letters from 23 year old Fireman Third Class Edward Scott Morgan, Jr., of Washington, DC. who reported aboard Cyclops on 24 August 1917. The following letters were handwritten. Several portions have been omitted. As we did not have a drill period this afternoon I decided that I would write you just a word. I am located in the main camp now and we were given liberty for the first time last evening August the ninth and you can imagine how glad I was when they turned us loose. I guess you will be surprised to hear that I am a finished Sailor, and that I am to go aboard a Ship in about a week. When and where we are sent we never know so you see it will be pretty hard to keep in direct communication with home. Mother read this carefully. Tell Clarence that if ever anything should happen that would require my returning home at any time it is absolutely necessary that he send me a telegraph. That is the only way I would be able to get a furlough and in any emergency do not fail to wire me immediately. I expect to be a wireless operator before long, but it will take a little hard work before I am able to qualify. Everything is progressing nicely, and the life is rather fascinating after a fellow gets used to it. We arose and had breakfast this morning at 4 a.m. so you can easily see they do not mind getting us out of our hammocks rather early, but as every man gets up at the same time we do not worry much about it. I have had several light spells of sickness since I have been here, but I am over them now … tough as leather, and as hearty as can be. I can do something I never did before, and that is roll up in any old hole, or on top of a table and go to sleep. As we are having the afternoon off; I thought that it would be a good opportunity to drop you a line. Clarence I am enjoying the sights, of our largest city now. I was on Broad Way several days ago and it certainly is a sight to see the bright lights at 45 St. I also traveled in the Subway which is a regular treat for one from Washington. Upon entering the East River we passed under the Brooklyn Bridge; out top masts were but about one foot from touching the bridge. It is now 9:30 by the Y.M.C.A. clock; and as the rays of the beautiful Sun of this most Glorious Thanks giving Day streams into this room I will attempt to write you a few lines. Tell Minnie that I received her letter at 11:30 Wednesday night, and I was surely glad to get it because I am invited to dinner at a private residence in the city, and if I had not received the letter I could not have gone. The jersey that Clarence sent me is just what I have been wanting. The muffler is certainly a fine one, and the head gear came in handy last Sunday night when we had to answer a fire call in the yards. There were over 200 couples there, and I think I missed one dance during the evening, and I had fine young ladies all by myself at refreshment time. So you see you really have apopular Sailor Brother after all. That is just one of the many dances I have attended in the last three weeks, There is a chance that I may be able to get home for a few hours in the next week or two. Please write soon, and tell me all about home. I am now in Baltimore but I am sorry to state that I will not be able to get home this time. We leave here Dec. 6, at 7 a.m. so it will be impossible for me to come home. We are going South on this trip so it may be some time before you hear from me again. Tell the girls not-to send me any clothes other than “socks” as I am overloaded now, but tell them they can send me a box of cakes & candies & Nabisco as all the fellows are receiving such a box; sent to them from home so I do not care to be the only one not to receive one. On this the last day of the old year I sit here in the Y.M.C.A. thinking of home. Clarence we are preparing for a trip which will last about six months. We sail for the Falkland Islands in the near future; from there we visit the Philippines so you can judge how long it will take us to go and return. To go to the Falkland Islands it will take 28 days. Do not worry about me as I am in the best of health and I expect to have the best time of my life. I have not had a slow moment since I have been in and the prospects for a slow time are small for the next six months; so I want you mother & all at home & live happy and forget your worries as I have done. Give mother all my best wishes of the season and tell them that when the song birds and the roses bloom I will return home again. Ewing can tell you where the islands lie. We will go though the Panama Canal. There will be no U Boats to worry us so you need not worry about that part of it. 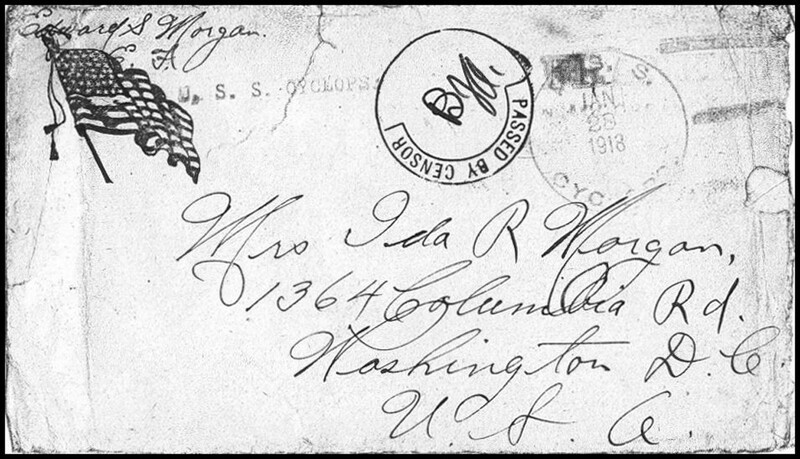 An envelope, postmarked on Cyclops on 28 January 1918, without a letter, was among the collection of Morgan letters [26. The Edward S. Morgan, Jr. letters were sent to President Franklin D. Roosevelt by Ewing S. Morgan, Birmingham, Alabama in February, 1942.] addressed to the sailor’s mother. It bears significance as it was postmarked on board Cyclops at Brazil and was also stamped with a device, “Passed by Censor”. The Censor [27. Dr. Asper Was Lost on Boat”, The Star and Sentinel, p. 1, Gettysburg, PA., Saturday, April 20, 1918.] for the ship was Assistant Surgeon Burt. J. Asper, whose initials, “BJA” appear, handwritten within Censor’s marking. The investigation and study of the loss of Cyclops should be undertaken to increase safety of life at sea. It is an appropriate learning experience not only to honor the memory of the officers and men lost with Cyclops but to attempt to determine the cause of this tragic loss of many Sailors and their ship 95 years ago. Captain Lawrence B. Brennan, JAGC, U.S. Navy (Ret.) is an admiralty lawyer who has tried many major maritime casualty cases for the government and private parties. His emphasis is on collisions, strandings, fires, explosions, and environmental disasters, particularly oil spills. The Cyclops went down in heavy seas off the East Coast south of Norfolk. The ship and her sisters were designed and built a Colliers not as ore carriers. She was leaking, in poor condition, a rust bucket that should not have sailed. Check out who ordered the sailing of the ship and the why she sailed. Political considerations took the place of concern for human lives. Top Secret? Wartime secrecy? She was not designed to be a Great Lakes ore carrier. She was designed and built as a Collier but was loaded according to the safe load marking in the cargo holds. Load marking for transporting coal not ore.
My father was awarded his American Citizenship ( Greek national ) for serving as an enlistee in the US Naval Reserve , as an AB seaman for a period of three unblemished years . He served from September 1911 to September 1914 . Isn’t it known now that the Cyclops was sunk by a German submarine that was off the United States Atlantic coast during the attack at Pearl Harbor? The Germans downed a large number of our non-military ships off of out coast. No, the reason being, is you have your wars mixed up. the cyclops went missing in 1917, during WWI, and the attack on pearl harbor was in 1941, which was during WWII. Also the Cyclops was not a non military ship, it was a us navy ship (military 100 %), it was a collier (coal carrier), it was not a civilian ship (merchant marine) , the crew where US navy sailors (military), it brought coal only to military ships, not civilian ships. . The Cyclops was a legitimate military target, and the Germans had books, as all navies do, that showed pictures and gave the statistics on all military ships, so they could tell the difference between a ships ownership and if it was a military ship or not. the Germans were very forth coming, as all nations were in time of war to claim all legitimate targets publically, regularly printed the names of the sunk ships in there newspapers. as well the crews of the ships received medals, awards and often cash prizes for sinking military targets, Also, the German official naval records show no German submarines in the area sinking any such ship in that time period of the war. We were at war with Germany, there would be no reason for them not to claim sinking it if they had. Most likely the storm on the US east coast was it’s fate, along with many other lesser vessels at the time. Remember the R.M.S. Lusitania our reason for entry into WW I ! German U- Boat U-20. Don’t know why this site says the Cyclops was theonly ship in it’s class? to add a sense of mystic to it’s unkonwn cuase of it’s loss? It was not, it was one of 4 of the Proteus class. and 3 meet unkown fates. The general consensus on the loss of the Proteus, Cyclops, and Nereus is that the coal they carried corroded the longitudinal bracing, and they broke up in storms. and the 4th, which became to Langley, (CV1) was sunk in battle in 1942. My uncle died a few years ago. Among the things he left me was a map to the Cyclops location with images of the ship and his notes about finding it. As a diver my self I hope one day to dive and see this ship for my self. But money problems keep this dream on hold. But know the cyclops has been found as I have the map and pic of it. I’ve located a newspaper account from 1922 which refers to the discovery of a message in a bottle from the SS Cyclops. There are some discrepancies in the newspaper report but there is enough there to throw some light on the loss of the ship, assuming it is one and the same. If you contact me direct I’ll send you the report. listed as still missing. “How could that be?” I thought. Like the Twilight Zone. i recently cleaned a grave marker, it was an 18 year old, sailor on the cyclops his parents deicated it. truly informative. І am gonna watch out for brussels.